7 out of 10 internet users in the EU like to shop online. No wonder, because never before has the selection of online shops been so large and the delivery conditions so handy. The parcel industry is also feeling the effects of this boom. In 2017 3.4 billion parcels were delivered in Germany. That’s nearly twice as many packages as compared to 2000. These parcels are often dispatched and transported within a few hours. However, problems often arise in the last mile when the parcel cannot be delivered directly to the recipient. We show you smart solutions for the last mile of your parcel. Target group: Anyone who wants to directly open the front door for the parcel carrier – anytime and from anywhere. Of course, our favourite solution is nello, because parcel delivery couldn’t be any easier. As a digital key, nello automatically opens the front door for the carrier. So your parcel will be right on your doormat when you get home. Give the delivery service permission to deposit the parcel at your desired location. This can be done directly online – often with just a few clicks. Set a time window for your parcel in the nello app. Delivery services inform you, when the carrier will approximately arrive. Not a good day? Choose your own preferred day for the delivery on the service providers webpage. That’s it! The carrier rings the doorbell, nello automatically opens the door and you are immediately notifiedin the app. Requirements: Door with compatible intercom system and door drop permissions for your delivery service. Even if nello is not yet compatible with your system, there are other smart solutions for you as well. Target group: Those who like to have the parcel with them quickly and don’t order anything gigantic. 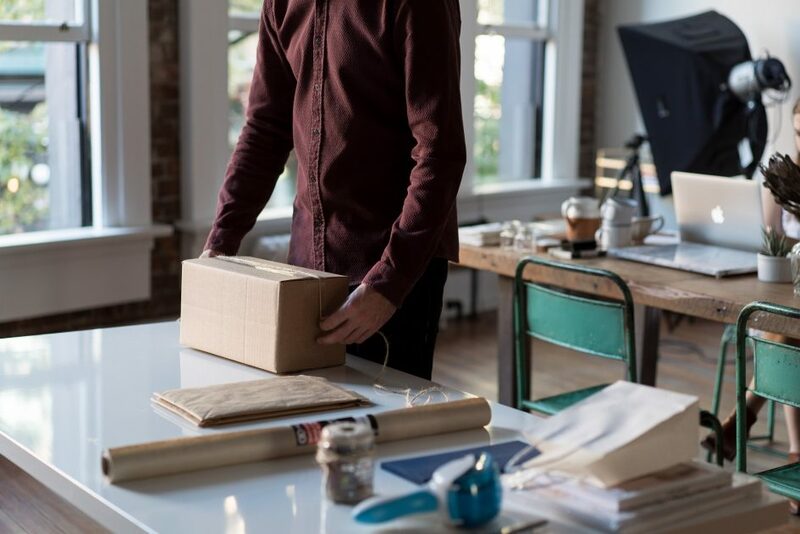 To receive your parcel personally, you can have it sent to your workplace. In small offices this is usually not a problem. In large companies, smart solutions such as Pikadoo and Packsy help to keep track of things. These systems record incoming parcels digitally and inform the recipient that the parcel is waiting for them at the parcel point. Requirements: Your employers permission and possibly an internal delivery system so that your parcel does get lost in the office. For large deliveries you need a plan for the transport home. Target group: For those who likes to have a personal contact person. Countless shops act as parcel shops for the largest delivery services DHL, DPD, Hermes and GLS. These shops receive your parcel and store it for you until you pick it up. Requirements: The parcel must be sent with the respective partner company. In some cases, there are weight or package size restrictions. Target group: Those who don’t want to be dependent on opening hours. 3,500 DHL Packstations are now spread all over Germany. The DHL courier places the parcels in the compartments. You get a message and you can pick up the parcel easily with your customer card. And that around the clock. With the “Amazon Locker“, Amazon has its own system which is very similar. Requirements: customer card or user account from the delivery service. Target group: For anyone who has a suitable location and is able give the carrier access to it. With most popular delivery services you can set a desired location for your parcel. This location should not be visible to strangers so that your parcel is safe. Requirements: suitable location (garage, garden, …). Formal door drop permission to the delivery service. Target group: Those who order parcels regularly and do not have a suitable preferred location at their house. Private parcel boxes or parcel boxes are suitable for a particularly large number of parcels. The box is placed next to the house, like a larger letterbox. The carrier stows the parcel safely in it until you get home. These boxes are for example offered by DHL, Renz, Paket Butler or Parcel Lock. Requirements: Permission of the landlord/other residents, space for the box, ordered parcels must not be larger than the box. Target group: Those who get along well with their neighbours. The classic among the solutions is the nice neighbour who accepts the parcel for me. At DHL, you can choose a preferred neighbour to will then receive the parcel. Requirements: permission given to the delivery company. Nice neighbours who are at home during delivery times. Amazon takes delivery to the workplace a step further. The company tests the in-car delivery directly into the recipient’s parked car. So the parcel is already waiting in the car when you drive home from work. Amazon is also already testing an in-home delivery service for Prime customers. The Amazon Key System gives the carrier access to the apartment and deposits the parcel there. The apartment door opens with a Smartlock. You can follow the delivery live via smart camera, or watch it later. However, there is still no solution for the lower entrance door. The system is therefore not suitable for multi-party houses. Both services are reserved for Amazon Prime customers and are only available in certain delivery areas. In the air or underground? The planned Amazon Prime Air project sounds like science fiction. The vision – drones will be able to deliver parcels within less than 30 minutes. In order to ensure the safety and reliability of these swarms of drones, a lot will still have to be developed and tested. A project with the beautiful name “The Mole” is pursuing a completely different vision. Parcels will be transported in underground tunnels instead of the air in order to relieve traffic. According to Mole Solutions, the company behind the project, this is primarily intended as a solution for companies in large cities. So the mole is unlikely to deliver parcels streight to your home. Whether or how machines will actually replace the parcel courier services has not yet been decided. Your next and next but one parcel will definitely be delivered by a parcel carrier. With these smart solutions, even the last mile won’t be a problem for you any more.